manage and train the student load during the first year of the grant. handle the expected volume of students training under the grant program. contact Dan Miller, k3ufg@arrl.org, for information on how to take part. training will open October 1, initially for ARRL field appointees. ”what really happens in the field” during an emergency or disaster. http://www.arrl.org/sections/?sect=EMA. I have also appended our STM’s traffic totals. I hope to see all of you at Boxboro! The [New England Division] Convention Committe has granted CEMARC a place on the activity schedule to hold our summer meeting on Sunday morning at 9:00am. I hope that at least one delegate from each radio club in Eastern Mass. will take the time to attend. If you can’t attend, please ask for someone from your club to attend and represent the club.I would like to ask each delegate to submit agenda items to me as soon as possible. I realize that many clubs do not have summer meetings, so I’m asking those of you receiving this note to forward it on to your own club members for discussion topics, that would be of interest to such a potenially large audience. 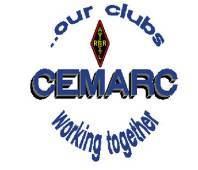 Remember,CEMARC meetings are open to all amateur operators, not just the club voting delegates. I look forward to hearing your suggestions for the agenda soon, also looking forward to meeting with all of you at the Convention. The ARRL New England Division Convention in Boxboro, MA on August 23-25, 2002 promises to be bigger and better than ever. This year’s banquet speaker is the ever-entertaining ARRL President Jim Haynie, W5JBP. On-site parking has been straightened out this year. A recent email indicated that hotel rooms have been sold out. This Convention promises to be one of the biggest and best yet! See www.boxboro.org for additional information. “I hope you’re all enjoying the summer and had fun at FD! I am […] the chairman of the W1A effort in Boxboro this year. I need volunteers for two-hour stints, Saturday and Sunday, to help supervise the Station (i.e., be the control operator). You can even run pile-ups during light times! I will also need volunteers to help set-up and take down. This activity is comparable to a Class 1A Field Day effort, except when you’re done, you can retreat inside an air-conditioned building next to a bar! If any of you are interested, please respond via email to me ASAP. All control op time slots are currently open, so first-come, first-served. “Field Day 2002. For some, it was the culmination of weeks of hard work and planning. For others, it was a wonderful occasion to socialize with old friends and to make new acquaintances…”I and other members of the EMA ARRL and ARES staff traveled throughout Eastern Massachusetts June 22-23 to visit with many of the radio clubs involved in this annual event. I’ve included my thoughts, observations and photos at http://www.temples.com/local/fd2002.html. I hope that you will take a moment and visit this page. On behalf of the EMA ARRL staff, I want to thank everyone who particpated in Field Day. Good job! Jim Ward has been licensed for over ten years. He currently holds a General Class license. Jim has been an active traffic handler for over 10 years, and has served as Net Manager of the Eastern MA Two Meter Traffic Net (EM2MN) for eight years. *N1LKJ* enjoys DXing, PSK, Packet and RTTY modes. A retired commercial property manager, Jim has been married 40 years this September to his wife, Diane. They have three daughters and six grandchildren. Jim inherits a well-managed operation from NZ1D. I want to thank Bill for his efforts! I’m sure that Jim can count on Bill’s sage advice, as well as the assistance of all the wonderful traffic handlers in the EMA section.